Sometimes - most of the time - this is my favorite month. 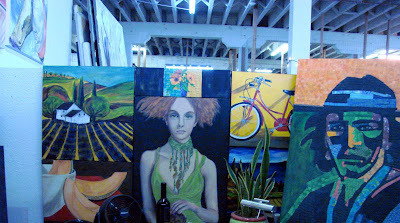 This year I am moving out of the art studio that I have rented for the last three or four years - mostly because I can't seem to get down there much. It is with mixed feelings that I am going - love the other artists, my friend Judy across the hall, Starbucks at the intersection. I also can't believe I've accumulated so much stuff there! I will be setting up in a garage that is right behind my apartment on Cortez Hill - less than 50 steps away. If I can't go there to paint, well, there must be something wrong with me.